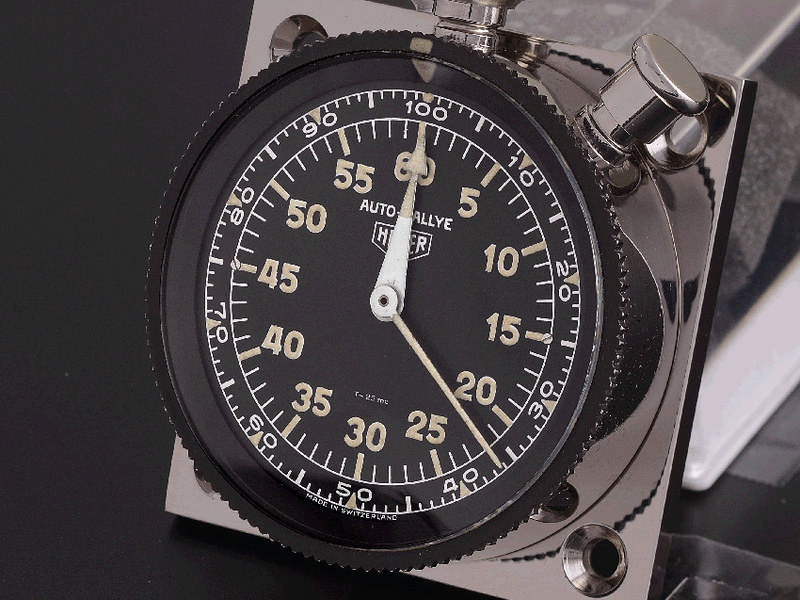 Over their 50-year history, there were six primary models of dash-mounted Heuer timepieces produced for automobiles – Master Time, Autavia, Auto Rallye, Super Autavia, Monte Carlo and Sebring. Mounted together on a double back-plate, the Master Time and Monte Carlo were sold as a Rally-Master pair. 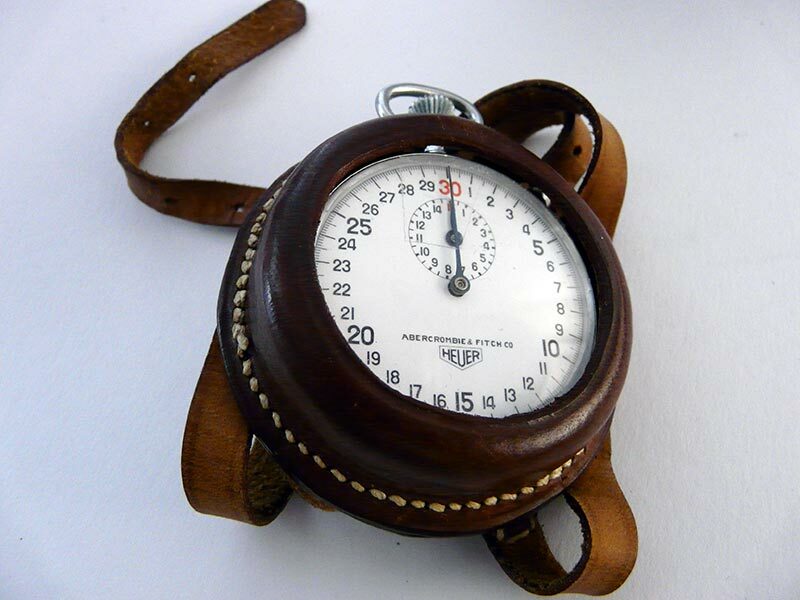 There were other models specifically designed for aircraft and boats, including the Aircraft Chronograph, the Aircraft Clock, the IFR timer, and the Navia clock. Different types of rallyetimer are up for sale. All items are functional. Before being presented on this website each watch will be revised by our master watchmaker. In this process the movement will be cleaned and the timing will be checked. Please note that the offer will change continuously. AUTO-RALLYE Ref. 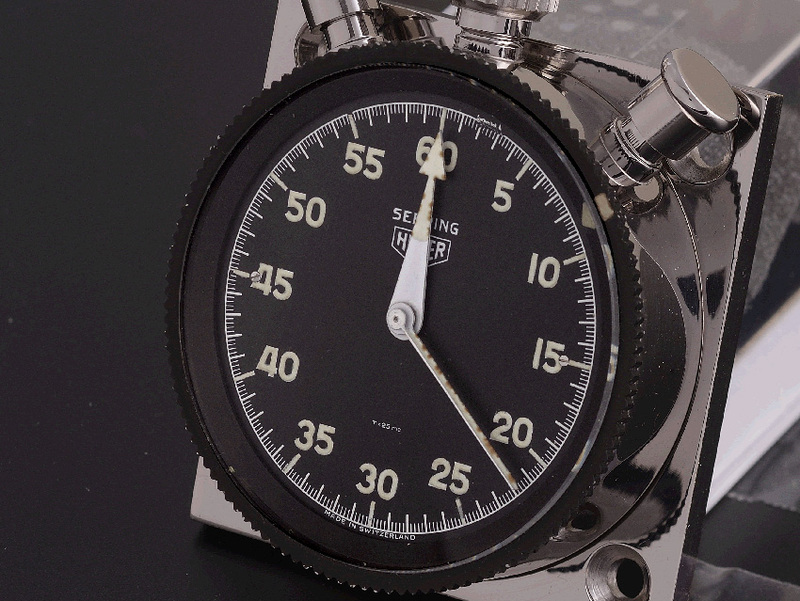 502.701: Standard dial, 1/5 second recorder, large hand registers 0-60 minutes, luminous dial and hands. 2 crown functions with time-out and locked return, turning bezel. 7 jewels, shockprotected. AUTO-RALLYE Ref. 502.704: Decimal dial, 1/5 second and 1/100 minute (decimal-) recorder, large hands registers 0 - 60 minutes, minous dial and hands. 2 crown functions with time-out and locked return, turning bezel. 7 jewels, shockprotected. Monte Carlo Standard Ref. 542.701: Standard dial, 1/5 second recorder, large hand registers 0-60 minutes, jumping hour disc shows 0-12 hours, luminous dial and hands, 2 crown functions with time-out and locked return of hands and disc, turning bezel. 7 jewels, shockprotected. Monte Carlo Tachy Ref. 542.717: Tachymeter dial, 1/5 second recorder, large hand registers 0-60 minutes, jumping hour disc shows 0-12 hours, luminous dial and hands. 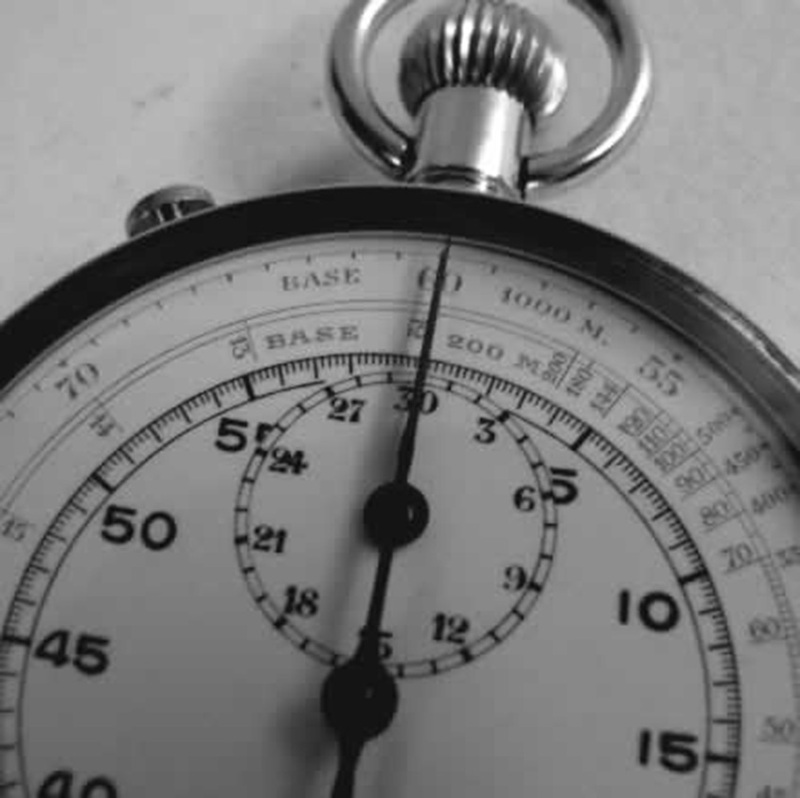 Outside tachymeter scale indicates average speed in km/h or miles/h from 60 to 300 over a measured and timed km or mile. 7 jewels, shockprotected. Monte Carlo Decimal Ref. 542.704: Decimal dial, 1/5 second and 1/100 minute (decimal-) recorder, large hand registers 0-60 minutes, jumping hour disc shows 0-12 hours, luminous dial and hands, 2 crown functions with time-out and locked return of hands and disc, turning bezel. 7 jewels, shockprotected. Ref. Master-Time 8 days precision clock with sweep second hand, luminous dial and hands, Hack feature for precise synchronization with official time signal, turning bezel. 15 jewels, shockprotected. Show either exact time or day or, if started at 12, total elapsed time. Ref. 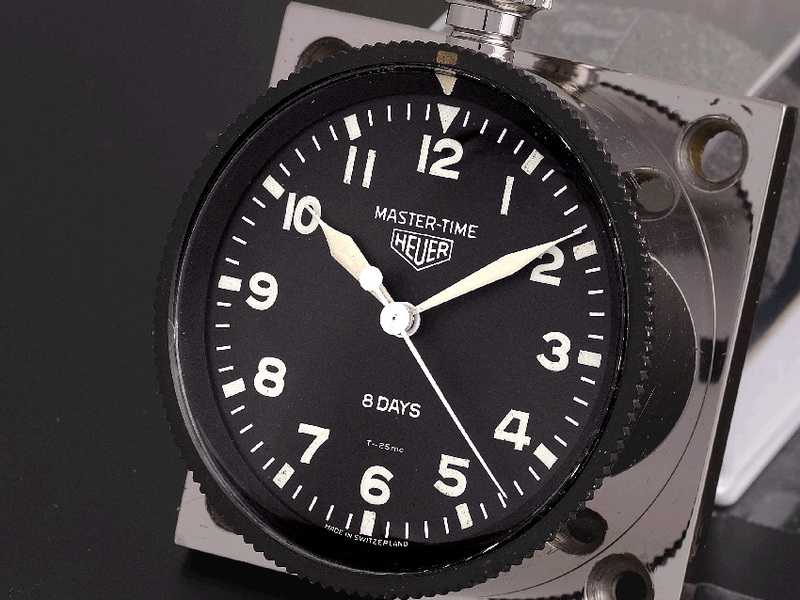 Master-Time 24h 8 days precision clock with sweep second hand, luminous dial and hands, Hack feature for precise synchronization with official time signal, turning bezel. 15 jewels, shockprotected. Hour hand makes 1 revolution in 24 hours. Master-Time: time of day (official time) or total elapsed time. Monte-Carlo: time of trip or elapsed time during individual lap. 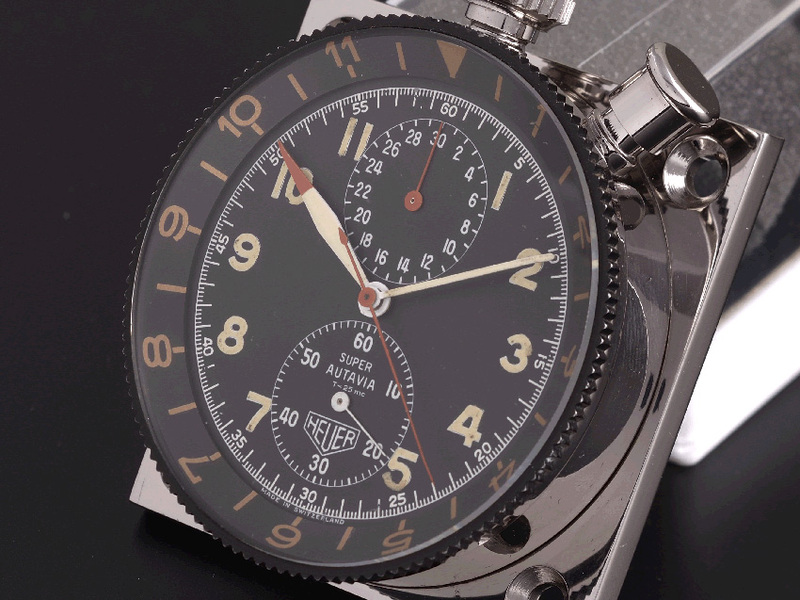 Dashboard chronograph. 1/5 sec. recorder, 0-30 jumping minute register, luminous dial and hands, turning 12h bezel. Hack feature for precise synchronization with time signal. Shows simultaneously time of day and time of trip up to 12 hours due to turning bezel. Precision movement, 17 jewels, shockprotected. Running time 36 hours. SEBRING Standard Ref. 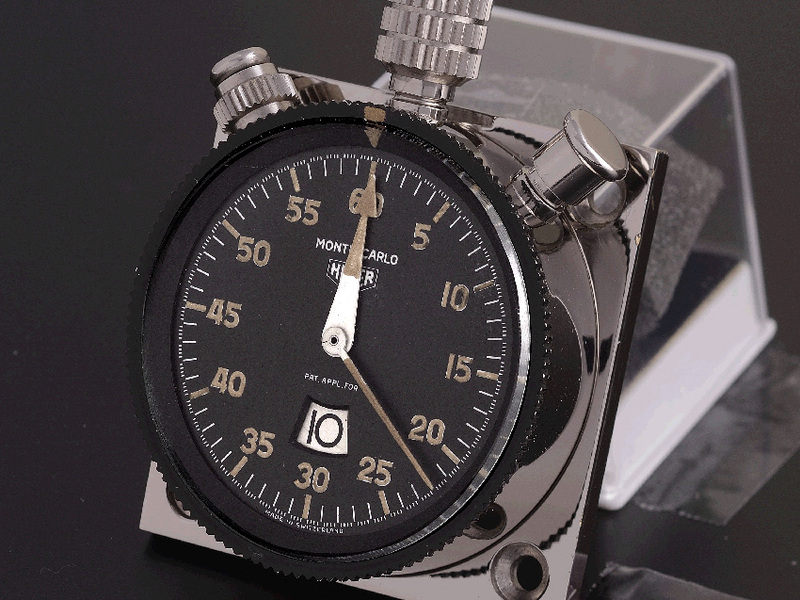 512.701: Standard dial, 1/5 second recorder with split action, large hands registers 0 - 60 minutes, luminous dial and hands. 2 crown functions with time-out and locked return, control of split action by left side push button, turning bezel. 7 jewels, shockprotected. SEBRING Dezimal Ref. 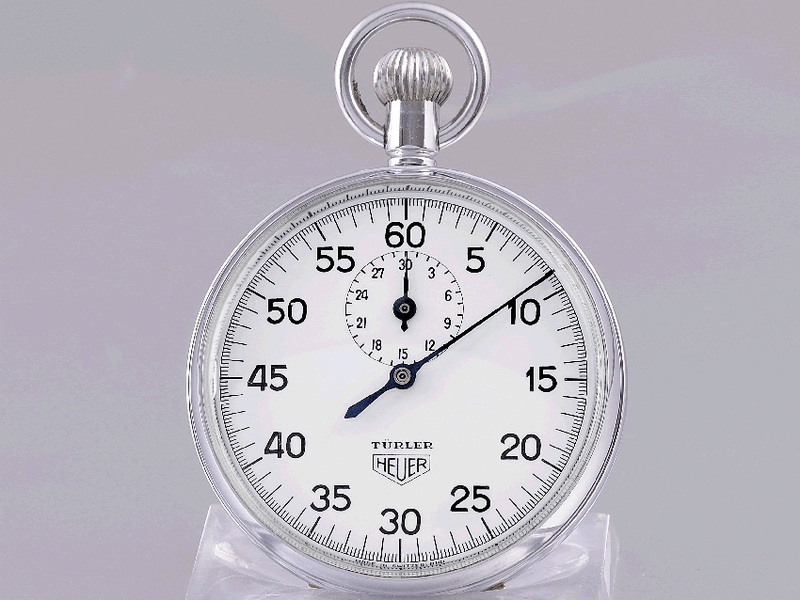 502.704: Decimal dial, 1/5 second and 1/100 minute (decimal-) recorder with split action, large hands registers 0 - 60 minutes, luminous dial and hands. 2 crown functions with time-out and locked return, control of split action by left side push button, turning bezel. 7 jewels, shockprotected. Highest quality standards: Every Heuer stopwatch is built to the highest quality standards of Swiss watchmaking tradition. Jewelled lever escapement, dual shock-absorbers on the balance wheel, temperature compensated hairspring, unbreakable mainspring and crystal are standard equipment. 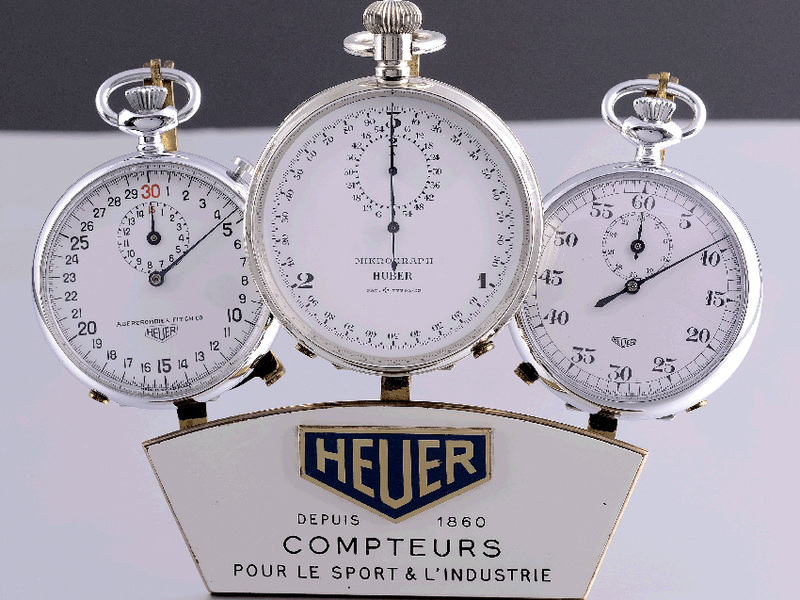 Wide selection: With over 100 different stopwatch models, Heuer offers the most complete quality range available on the world market in 1960ties and 1970ties. 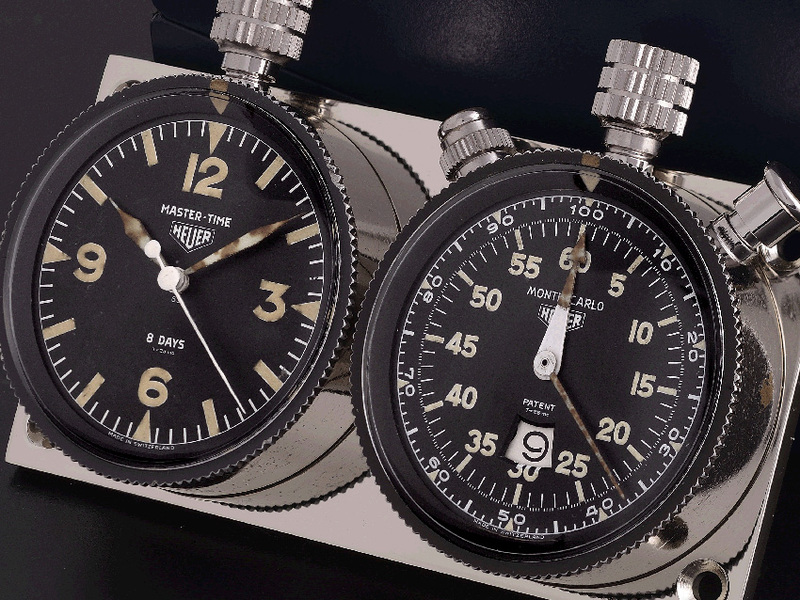 For every possible timing need Heuer can supply the most suitable staopwatch. 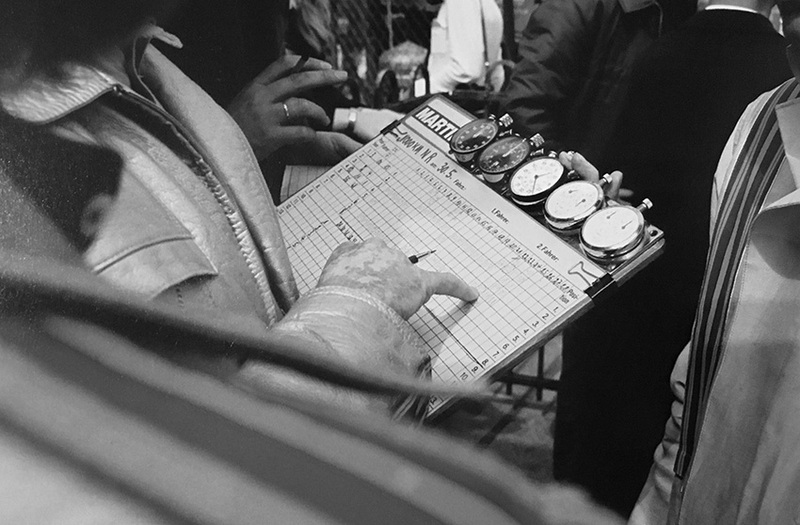 Built for rugged use: Stopwatches are often dropped. 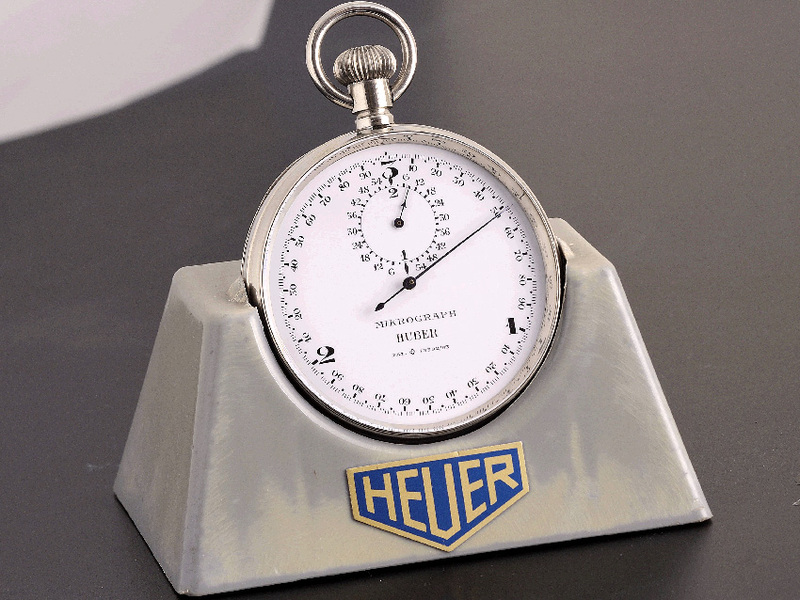 A Heuer stopwatch will resist a vertical drop of at least 3 feet on a hard wooden surface. In addition to a special shockabsorbing system which protects the balance wheel pivots, the balance bridge is supported at both ends for increased stability. Outstanding accuracy: Nearly all Heuer stopwatches are equipped with special micrometer regulating device for final accuracy adjustments. Through electronically controlled regulation, tolerances have been lowered to less than +/- 0,01%.